Mark Taylor, left, and Rohan Allen, right, both from Catholic Charities, Diocese of Camden, are helping out with relief efforts in Louisiana. Also pictured are Chip Leckway of Denver and Brissa Ladezma of Oklahoma City. Taylor, along with Rohan Allen, a disaster case manager with Catholic Charities, has spent the last two weeks deployed to Baton Rouge to assist in the recovery efforts following the natural disaster that hit the Bayou State on Aug. 11, spilling rainfall at rates of two to three inches for almost 48 hours, damaging or destroying more than 146,000 homes. 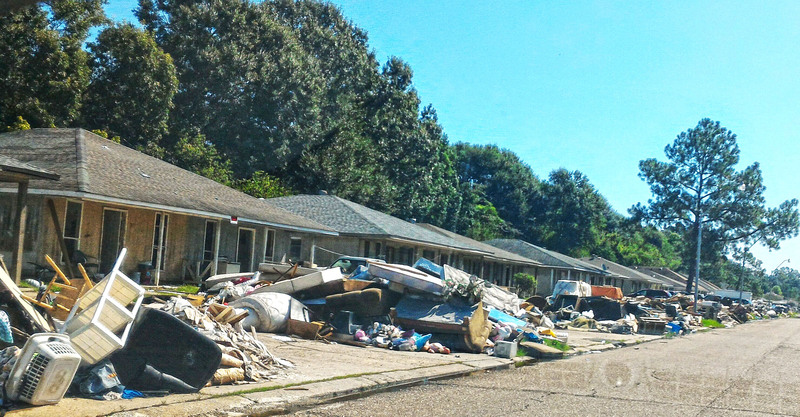 Debris is seen in front of flood-damaged homes after historic flooding in Louisiana last month. Two employees of Catholic Charities, Diocese of Camden, are helping in relief efforts. 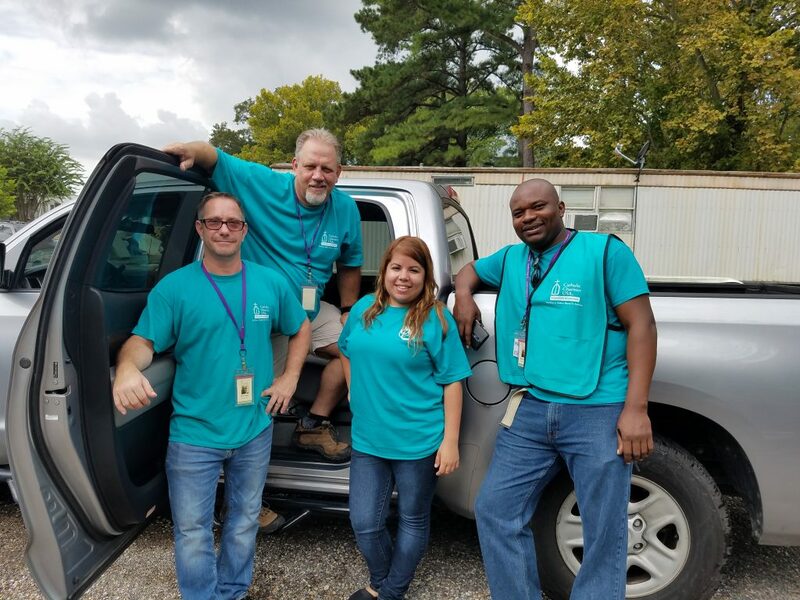 Taylor and Allen spend their days working in warehouses, helping to organize, load and transport needed supplies to parishes and distribution sites around the Baton Rouge Diocese. They are also involved in long term recovery efforts, connecting individuals living in shelters with the right resources to begin the process of rebuilding their homes and their lives. Allen, who is fluent in English, Spanish and Creole, has been a particular asset in the Hispanic community of Baton Rouge which took a devastating blow from the storm. David Aguillard, executive director of Catholic Charities, Diocese of Baton Rouge, praised the work of Allen and Taylor. “Rohan and Taylor have been a blessing to our community, and we’re thankful for the support of the Camden Catholic Charities. Both Taylor and Allen are no strangers to emergency response. Taylor has had extensive training and experience including serving as agency lead for disaster relief following Hurricane Sandy that involved a month-long deployment to Sayreville, New Jersey. He has also been deployed to Catholic Charities in Denver in October 2013 when major flooding and rainfall from mountains wiped out several towns. Allen has had over three years of experience in disaster case management work and was involved in securing help for Sandy-affected households as well. He also deployed to Catholic Charities in Houston after severe flooding that occurred in that region in 2015. Taylor and Allen have been staying at the Bishop Robert E Tracy Center, a retreat center that is owned by the Diocese of Baton Rouge, where they were warmly welcomed by the Catholic Charities of Baton Rouge staff. Taylor spoke of helping a Catholic Charities employee gut his house that had been under five feet of water. Bishop Dennis Sullivan has asked all parishes within the Diocese of Camden to take up a special collection for the Louisiana flood victims on the weekend of September 24-25.